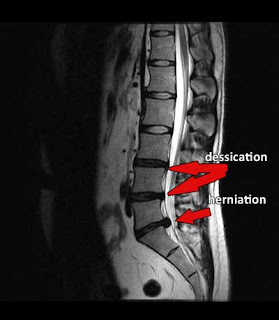 The picture above is of a Lumbar Herniated disc at L5 S1. This patient came in doubled over in pain and walking with a cane he looked like a 90 year old man at 35. What is amazing is that he is on Percoset,and muscle relaxers and already had three epidurals. What's next for this patient? What is the best treatment for a herniated disc? Well, he was told that he could have a back surgery or learn to live with this pain. He emailed me his MRI results and we discussed possible options over the phone and he came in for treatment the next day. Today marks his 5th visit on the DRX 9000. I am impressed with his progress so far. When he first came in every position hurt, he could not sit,stand or even lay down without shooting,burning pain into his leg. Everyone in the waiting room felt bad for this guy! Today he is moving allot easier and can actually walk back to the treatment room without being assisted. Getting around in New York City is difficult enough but to have to navigate the streets and subways with a cane and a massive limp makes it worse. I am glad he choose a non surgical approach to his problems. This treatment works and in my opinion there is no better treatment for herniated discs then non-surgical spinal decompression. If you live or work in Manhattan NYC and suffer with Chronic back pain consider this treatment before getting a invasive surgery. I will update this patients status and update a post MRI to show the reduction of the disc herniation.